Extra large vacuum sweepers equipped with a suction hose. Manoeuverable vacuum sweepers with a loading volume of 14 – 20 m3 equipped with a suction hose. This allows you to vacuum and collect waste material from the most difficult places quickly and efficiently. Despite their compact size, they have a large loading capacity that reduces the time of driving back and forth from and to an unloading point. A powerful fan provides an enormous suction power and is mounted in a housing fitted with a replaceable lining. The fan is driven by a PTO drive shaft attached to the tractor and requires an output of The required hp PTO can vary depending on the working conditions.90 – 130 HP (66 – 96 kW). Extra wide radial tyres and an optional swing axle with 4 wheels in line, ensure a very low ground pressure. 1. A 350 mm hose on a hydraulically controlled boom that can optionally be operated with a joystick. This can be mounted both on the left and the right side. 2. The large vacuum sweepers can be equipped with a 6 metres long flexible suction hose with a diameter of 250 mm. The end piece is fitted with a comfortable hand grip, a roller wheel and a rubber end piece that allows collecting large amount of material quickly and efficiently. 3. With a suction hose TRILO vacuum sweepers can also be combined with any type of mowing arm. 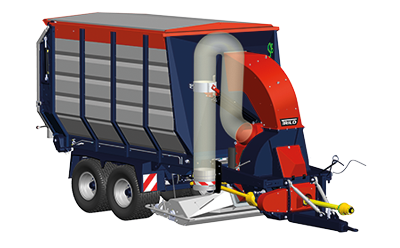 • Mobile vacuuming of waste material. • Easy emptying with chain floor.